Celebrate Crafts: "Happily Ever After"
Welcome to our May Art Philosophy/Artiste Blog Hop! As you know, both the Artiste and the Art Philosophy cartridges are available exclusively through a Close to My Heart consultant. If you don't already have a Consultant that you are currently working with, please contact one the Consultants in our hop with any questions you have! If you have just hopped onto my blog, please start at the beginning at Lucy's blog – Love 2 Create If you came from " Lucy's blog – Love 2 Create" of " then you are in the right place! Our challenge this month features not only one of these amazing cartridges but we also have a Wedding theme. There are so many weddings this time of year! Do you have any weddings coming up? kids had done a number on the frame, and I thought it could a little sprucing up. I took black card stock and I raced the frame onto it. I cut out the image and used liquid glass to glue it to the frame. I used a sanding block to sand all of the edges, which gave the paper and aged look. cut the Mr & Mrs and the silver hearts (silver heart border is glitter paper) from the Artiste cartridge The flowers are cut from Art Philosophy. 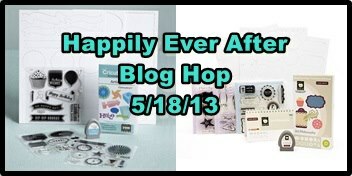 Your next stop on our "Happily Ever After" hop is "Wendy " of "My Scrapbooking Blog"
Thanks for hopping along with us - we hope we were able to inspire you in creating your own wedding themed projects! Nice approach to personalizing the frame...very nice.